The importance of furniture assembly and furniture disassembly is one of great concern for Jake’s Moving and Storage whether it’s a commercial or residential move. The number one priority for us is our customers and we take pride in our exceptional, friendly customer service provided in the states of Maryland, Washington D.C., Virginia, and surrounding areas. Choosing local movers you can trust is imperative whether we are needed for residential moves or moving your office out of state. If you are not familiar with this service, you might ask yourself exactly what is furniture assembly and disassembly? Our movers and packers will assemble and disassemble your furniture at your home or office, if requested. We can either disassemble your furniture at your old location, pack it for you, and move it, or we can pack the already disassembled furniture, and assemble and organize/install the furniture for you at your new location. There are several examples of what is included in our furniture assembly and disassembly service: beds, tables, desks, lamps, chairs, bookshelves, cabinets, couches, futons, as well as chest of drawers to mention just a few items. For office moving, our furniture assembly, disassembly, and installation services include office furniture such as: cubicles, office chairs, machinery, and additional furnishings in the office. When packing your disassembled furniture, we are extremely cautious with your treasured, fragile items. They are meticulously handled with special care with the necessary padding and support needed for each piece to prevent any damage. We even supply tailored packing supplies for any uncommon shape or flimsy object. By taking these extra precautions, scratches, dents and other damage to your beloved belongings are prevented. Sometimes, move-in dates and move-out dates don’t necessarily sync, and at Jake’s Moving and Storage, we offer the option to safely store your items in our storage facility in VA, MD, or DC or whatever location that is convenient for you. If you should need this service, be rest assured that our fast and friendly local movers will give you the choice of having your pieces disassembled and stowed away or packing your previously disassembled furniture to be held in storage until you are ready to move. When you require the services of a stellar local movers serving the residents and businesses of Maryland,Washington D.C., Virginia, and surrounding areas, choose a company that is licensed, bonded, and insured as our company is. You can be assured that our organization furnishes you at all times with professional moving and packing services. We are confident, as you will be after your experience with us, that you will spread the word to highly recommend us with no hesitation. Think about us for all your furniture assembly and disassembly needs, along with moving, packing, and storage whenever the occasion arises. You will never have to worry about unexpected unplanned charges with our flat rate, up front pricing. Relax and put your trust in our professional movers – you are in good hands. 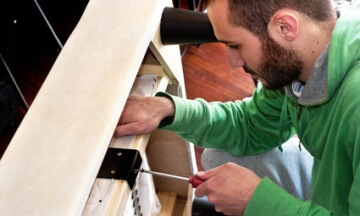 Furniture Assembly and Disassembly Service https://jakesmoving.com/furniture-assembly-and-disassembly/ 3.9/5 based upon 25 reviews.